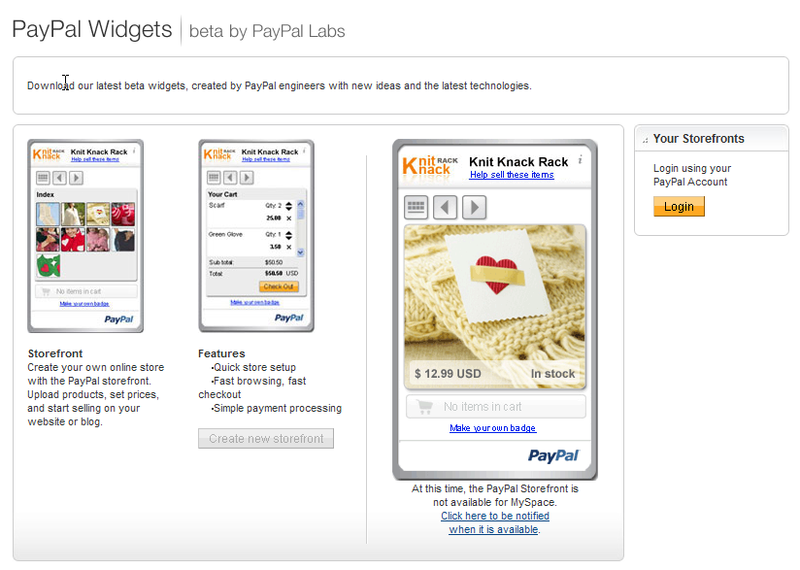 PayPal has introduced an easier way for setup online shopping on your website with a web-based widget. This is a great tool for any community, charity, club, nonprofits and fundraising website. The PayPal Storefront Widget lets you embed a virtual storefront directly into your blog, website or social networking page. With the holiday season upon us, I see this as a perfect tool for nonprofits looking for a quick and easy way to sell gifts, donations and other merchandise online. 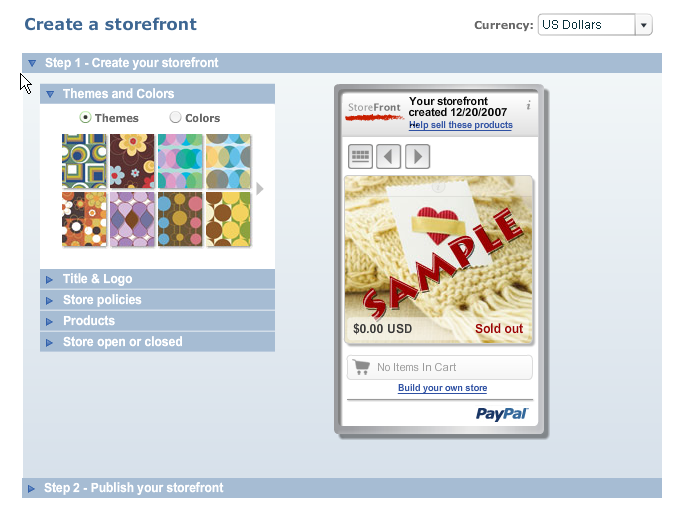 The Paypal Storefront lets you create a simple display panel which features items you have for sale. People can browse through the different products and with just one click are able to read a description of it and add it to their shopping cart. The widget includes a picture index of the items for sale through the widget, product pages giving customers a larger view of the selected items, an in-widget shopping cart, and a page that explains the store’s policy and conditions (also within the widget). Finally, the widget lets other people display your products on their own websites, you could use it as an advert that you change from the PayPal site so it updates automatically across the other sites. Some limitations include prices only being displayed in US dollars and paying a percentage of any sale as a fee. 1. 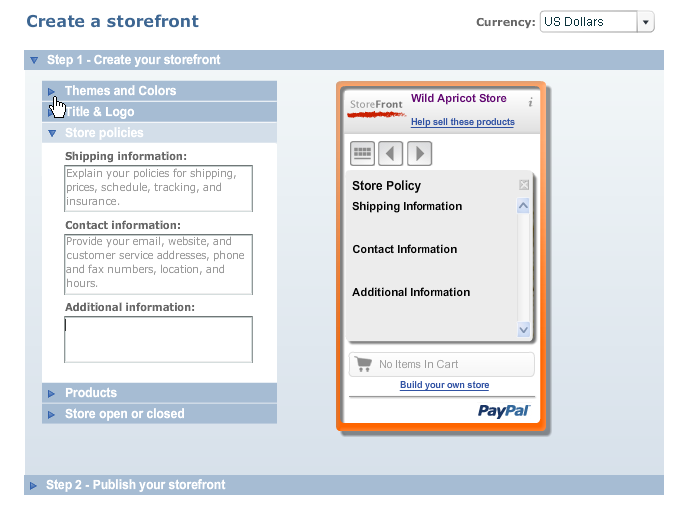 Go to the PayPal Storefront Widget Page and login to PayPal if you have an account. If not create one. 2. 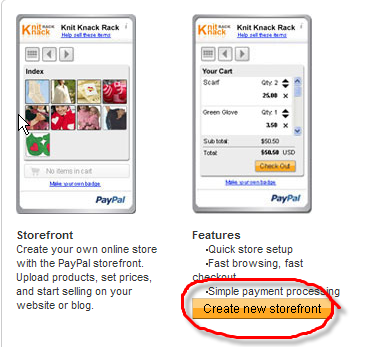 Click on Create new storefront to begin the customization proccess. 3. Choose a Theme (like a wallpaper) or color. 3. Choose a title and logo. 4. Add your shipping information, contact information and additional information. 5. Add your products. You can have multiple products to sell and it will scroll through them. 6. Choose if you want your store to be open or closed. 7. Post the widget on your website, blog or social networking page. Add your storefront widget with just one click. 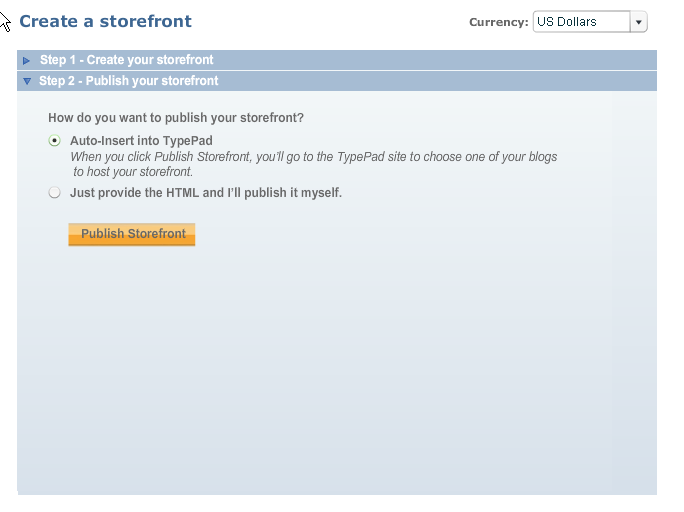 If you have a TypePad blog you can publish. Or just grab the HTML code and paste into your page where you want it to display. 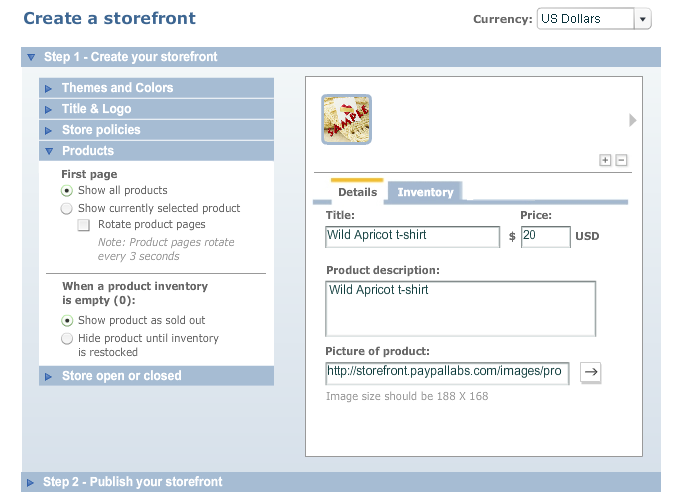 Share it with your network and ask them to post the storefront widget on their sites. 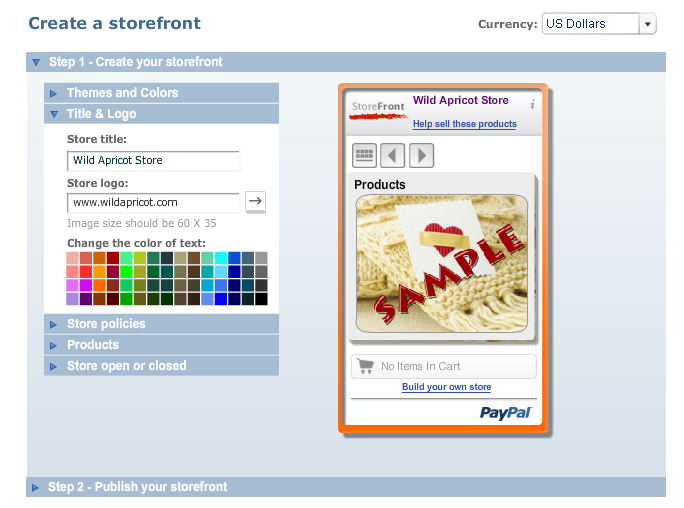 So this is how you would create a Paypal Storefront widget. How do you see yourself using this on your site? http://www.typepadhacks.org/2007/12/the-paypal-stor.html and actually started playing around with it for my Beyond the Glass Ceiling blog. It is VERY easy to use and set up and I think does have a lot of good applications. Although it's geared toward products, I'm curious about how well it might work as a way to have people sign up and pay for events, like workshops, etc. I used PayPal for my retreat earlier this month and if it could be done through the widget, that would be even better. That's something I want to play around with some more. Thanks! Found this news here first. Great innovation from PayPal. They've come a long way since their early days. I wonder if this release was a reaction to Google Checkout. It certainly has more functionality for product sales, though that might not be important for most non-profits. I know the non-profit I volunteer with will stick with Google Checkout for our event ticket sales and donations until 2009 since they have waived all fees: http://checkout.google.com/seller/npo/. Wow! What a great concept. Nooo, silly, not the widget. the part about sharing it across multiple sites. They belong to a fairly large business networking group. They should have a widget-raising festival! Once the organization has permission, they can follow up with an email that thanks the business for participating and then asks for the email address of their WEBMASTER! Obviously, 100% participation will not happen, due to non-response, but, like any fund-raising campaign, a consistent and persistent follow up should increase the number of businesses who get the widget installed. If I were spear-heading this effort, I would be more detailed. I would make sure that particpants had the option to provide an internal link to the widget if they didn't like it on the home page. However, if I check out their site and saw ads on the front page, I would really, really try to talk them into allowing the widget to share some space - it's for a good cause, after all! The power of this multi-site affiliation can not be understated. If we can discover clever ways of making the widget less intrusive, we can convince more and more people to particiapte! the second link in the above is obsolete. Well, this was posted about 18 months ago. You will have to do some research to see what happened since then, we will do the same. 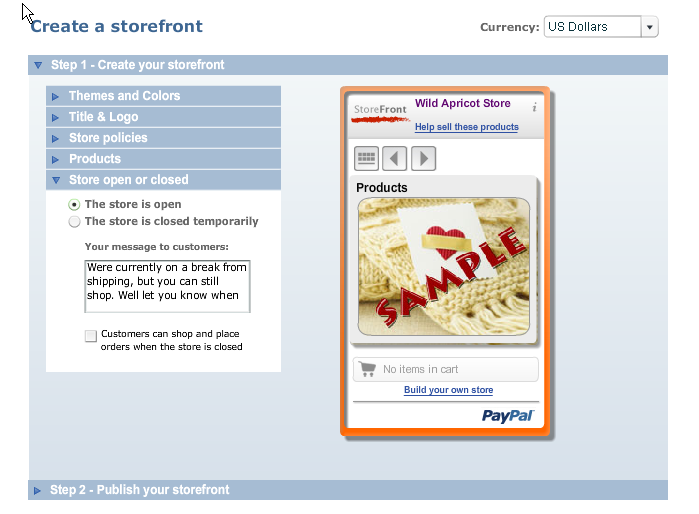 I am presently looking into Rebecca 'Curious Apricot' Leaman' idea of beta PayPal's StoreFront. Is there a way to link the stofreont sales to the "trasnaction list" of a community? this is a great piece of news. I'll look into it. I have a question. We use a shopping cart to take orders and PayPal as merchant, so that the digital products are loaded into the shopping cart. Do you know what happens in this case? Also, our blogs are in Wordpress, which seems not to accept so many widgets. Have you heard if they take this one? Maria - I am not sure I fully understand your questions, can you please send it to our support team with more details? It was super easy. It took 5 minutes to get the store up and working. We simply chose the Page Template that was Three Rows & Three Columns and then inserted pictures for the products. It works great for our needs.